The Great Barrier Reef is undisputed as one of the world’s most important natural assets. It is the largest natural feature on earth stretching more than 2,300km along the northeast coast of Queensland, Australia. To put it in perspective, it covers an area about the same size as the United Kingdom, half the size of the state of Texas or the length of the entire Japanese island chain. It is the only natural structure that can be seen from outer space. 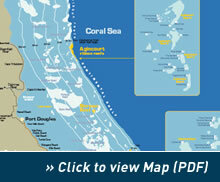 The Great Barrier Reef Marine Park (GBRMP) is a series of over 2,900 individual reefs, stretching from the tip of Cape York in the north to Lady Elliott Island in the south. Covering over 348 000 km2, it comprises fringing and barrier reefs, continental islands, coral cays and 70 different bio-regions, making it the most ecologically diverse system in the world. Although coral reefs have been around for over 500 million years, the Great Barrier Reef is relatively young at 500,000 years, and this most modern form is only 8,000 years old, having developed after the last ice age. This World Heritage listed marine park supports the greatest concentration of life on the planet with over 1,500 species of fish, 400 different corals, 4,000 species of molluscs and 10,000 species of sponges. Six of the world’s 7 species of sea turtles are found here. Whales are often encountered in these waters from May to September. It is not just one reef, but made up of over 2900 reefs, 600 rocky continental islands and 300 coral cays.